As I write this, in the early summer of 2018, Robin Ticciati has just stood down from his role as Principal Conductor of the Scottish Chamber Orchestra, a post he has held since 2009. In fact, he has only one more scheduled engagement with them: a pair of concerts in the 2018 Edinburgh International Festival where he will play all four Brahms symphonies, no doubt a decision made to tie-in with this set of discs. Ticciati’s style of programming with the SCO has, broadly, been to focus on one particular composer in a season. It was Dvořák in 2017-18, and previous seasons have had focuses on Schumann and Berlioz, with recording projects ensuing, including their excellent set of Schumann symphonies and Berlioz’s Symphonie Fantastique. 2015-16 was the year of Brahms, and it featured all the symphonies plus the German Requiem as its keystones. It was a mixed success for me and, worse, it was marred by Ticciati’s recurring back trouble, meaning that he had to step aside for someone else to conduct No. 4 and the Requiem. The following summer, however, they were tempted into the recording studio to set down the symphonies for Linn, and the results as captured here are mostly very good. Much of how you respond to them, however, will depend on personal taste and, for me, they’re a mixed success that improves as they progress. Ticciati’s approach is to put Brahms in his context and to use period style to strip away the über-Romantic patina that has accrued to him since his own day. Strings, therefore, play with minimal vibrato, and tempi are broadly pretty nippy. The trombones are small-bore, and the horns are 19th century Viennese instruments that Brahms would likely have recognised. In the notes, Ticciati says he was looking for “a certain historic colouristic detail”, and that’s probably helped by using an orchestra of the size of the SCO. After all, Brahms himself loved to hear his music played by the orchestra at Meiningen, which had roughly the same number of players that the SCO has assembled, and that’s something that Sir Charles Mackerras brought home in his 1997 set. That can lead to a loss of power, though, and this is where the personal taste element comes in most strongly. There’s a new orthodoxy developing around Brahms performance these days, into which Ticciati firmly falls, that the old-school big-boned symphonic performances have harmed the transparency and flexibility that Brahms wrote into his scores, and that what we, therefore, need to do is strip back the accrued tradition and find the gleaming jewel underneath. That’s fine in its way, but I say two things in response to it. Firstly, that battle has surely now been won. Mackerras was in its vanguard as far back as the nineties, and in the noughties John Eliot Gardiner’s Brahms series with the OAE did it too, so there’s nothing especially novel or ground-breaking about Ticciati's approach, for all the adulation that has been lavished on it from so many sides. Secondly, while this is a perfectly fitting alternative approach, I rather like the old school Brahms style. For me, giants like Karajan, Böhm, Furtwängler and Kleiber got it pretty much right (all in their own distinctive ways, of course) and, for all its merits, there was nothing about this set that made me want to turn to it ahead of those twentieth century giants. It’s that lack of power and impetus that made No. 1 the least successful interpretation, for me. As soon as that blazing introduction begins you notice that smaller sound: there’s no way you’d mistake it for Klemperer! That also translates throughout the symphony into, yes, more airy textures, but also less heft, and I frequently found myself wanting more. The end of the first movement’s introduction, for example, is notably dialled back and, to me, lacking in power; and at the end of the development the violins risked being overwhelmed by the brilliantly energetic contribution of the rest of the orchestra. Likewise, the lighter approach to the finale is a bit lacking, even though it won me over slightly more, and Ticciati just about pulls it out of the bag with the chugging approach to the finale’s coda, though the very end feels just a little cursory. For all my complaints and personal preferences, however, I did still find plenty to enjoy, even to revel in on occasion. For example, there’s a silkiness to the violins’ opening lament that is unusual and, also, rather seductive, even if it dials down the tragedy. The opening allegro is taken at a speedy tempo with a generally lithe feel to the sound, and there are also some cheeky portamenti in the violins’ descending phrases that add something very distinctive. In fact the orchestral texture as a whole is very carefully graded and controlled, allowing, for example, the horns’ contribution to the end of the development to make itself heard particularly distinctively. Furthermore, having period timpani makes their jabbing thrusts sound even more on-the-note than usual, like a diamond cutting glass, and the solo instrumental playing is outstanding throughout, with woodwind solos sounding particularly lovely in the calmer moments of the first movement. Even more so, the alphorn solo of the finale is really outstanding (principal horn Alec Frank-Gemmill on his finest form), ringing out with clarity and brilliance while also sounding human, and the trombone chorale that follows feels understated and beautifully rounded. The second movement is more conventionally paced and, for me, more successful. The texture is better blended, too, with the violins more evenly matched against the remainder of the orchestral bed, and that’s also true of the beautifully sunlit third movement. I found the phrasing of finale’s main theme a little wilful, however; the ending of every phrase sounding clipped, as though being deliberately abbreviated. Ticciati’s willingness to let the daylight in is welcome, but it’s a little mischievous in a way that, for me, breaks up the theme’s flow (and is then soundly forgotten as it is reappears in the rest of the movement). There is another injection of daylight into main theme of No. 2’s first movement, creating a sighing effect that you’ll seldom hear elsewhere, though I confess this bugged me less than it did in No. 1’s finale. The orchestral sound is lovely, however, and it brought to light especially the gorgeous sound of the cellos and violas. In all Ticciati’s rethinking of the orchestral texture, it’s these middle strings that come off the best, and their take on the second theme is delightful. You also get that in the second movement and, perhaps most obviously, in the autumnal Allegretto of Symphony No. 3. I had the same thought as they launched No. 2’s second movement, a kind of silky, almost feline feel coming over the sound, which won't be to everyone's taste (and I'm not entirely certain it's to mine), but is effective in its own way. There is then real turbulence in the central section after which the coda comes as blessed relief. The winds are especially sweet and lovely here, as they are at the opening of the pastoral third movement, and the finale is pacey but also restrained, its conclusion coming across as cultured rather than euphoric. No. 3 strikes me as the least interventionist interpretation and, therefore, I warmed to it more. The pace of the first movement is energetic without being wilful and here, more than anywhere else, the period sound gives the music an edge of exhilaration without any self-consciousness. The lean string sound in the first subject, for example, gives the music a tiny extra edge of excitement as it hurtles downwards, and the openness of the general texture allows the horn solo (and the contrabassoon) to sound pretty special in the slow passage at the end of the development. The wind theme at the opening of the slow movement is full of beautiful pastoral simplicity - even if I would have preferred a less wiry string tone in response to it - and there is a palpable tingle of electrify to the finale, which builds to an exciting climax before receding into a coda of lovely peace. The cellos sound a little unusual in the main theme of the famous third movement, but very fine, as is the subsequent horn solo, glowing like an autumn sunset, and these two instrumental sections confirm their status as the most interesting element of Ticciati’s Brahms sound world. Ticciati’s poor health meant that his view of No. 4 never made it to the concert hall, so this was the interpretation to which I came with the freshest ears and fewest expectations. I must say I liked it very much: in fact, it’s probably the most successful of the set for me. For one thing, it’s very well thought through, sounding as though Ticciati has really considered it and built it afresh from the ground up. The first movement has an air of quiet determination to it, the wiry string tone helping here, and the wind triplets that launch the third theme lead into a subject of decisive attack. The development then has an air of something unarguable and inevitable about it - something that returns in the granite-like finale - and the recapitulation builds to a coda that hinges round a huge final “Amen”, made all the more powerful by the thrilling hard edge of the timpani. I also liked the no-nonsense approach to the second movement, giving the whole thing the archaic momentum of an ecclesiastical procession, and they even find some juicier-than-usual string tone for the great iteration of the second theme in the recapitulation [7:30]. The Scherzo is also a thriller, helped by the crisp, utterly-on-the-note intonation to sound bright as a button, without a hint of gloop. Ticciati then manages to turn the finale into something of a nail-biter, dialling up the inevitability of the tragedy with each turn of the screw, and even managing to create an element of the new and the fresh with each twist and turn. The flute solo is limpid and expressive, while the trombones add real drama and urgency to the soundscape as well as to the musical argument. Several explosive bursts of passion see us through to a coda of huge power that seems to swirl downwards towards its unstoppable conclusion, setting the seal on the most memorably successful performance on them all. So while I commend the playing and the vision of this set, I can, as yet, give it only a guarded welcome. 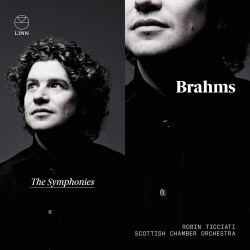 I respect and applaud much of what Ticciati and the orchestra were trying to do: I just don’t particularly like much of it, particularly in the first symphony. That’s mostly a matter of personal taste, however, and I may well change my view after listening to it several more times. Even I can acknowledge that No. 4 sounded exciting and new, so perhaps there’s hope for me yet. There are no fillers, be they overtures or variations, but that means that all four symphonies can be fitted onto two discs, a definite point in the set’s favour, and that’s also helped by choosing the exposition repeat in only No. 3.